According to Forbes, Bill Gates is worth roughly $96.4 Billion as of 09/11/18. If the man that co-founded Microsoft is worth that much money, it begs the question to how much Microsoft is worth. These days, fortune 500 companies are only worried about how to get more cash in their pocket. That’s why they create things like an Xbox Live Membership, and it currently has roughly 39 million monthly active gamers. With that many consoles being sold why does Microsoft think it’s necessary to charge their customers to be able to play online? Microsoft is selling millions of these consoles for $300 a pop, and they still charge their users another $60 a year to get the “full gaming experience” and be able to play online. It would be different if the consoles had a built-in Wi-Fi system that allowed the gamer to play online without Internet access, and to use that system you would have to purchase a membership. Instead, in order for an individual to be able to play online with his or her buddies, they need a console ($300), Xbox Live ($60/year), a game ($60), and Internet connection ($600/year). That’s a lot of money to dish out every year to be able to play online. So why did Microsoft create the Xbox Live membership? It comes down to Microsoft wanting another stream of income. As I stated above, Xbox Live currently has 39 million users. If each user were a member for a year, Microsoft would be generating $2.3 Billion every year. It’s very unlikely that every gamer is has a membership year round, but even if each user had Xbox Live for a month, it would generate roughly $273 Million. That’s why Microsoft is never going to make Xbox Live free. In November of 2006, everyone leaned toward the PlayStation 3 as Sony didn’t require their users to pay in order to play online. Sony quickly realized after the success of the Xbox 360, that they were missing out on a very lucrative income stream. So what did they do? Sony came up with the PlayStation Plus membership. The PlayStation Plus membership is essentially the equivalent to Xbox Live. To play online with friends, you have to have a PlayStation Plus membership. Xbox Live codes For Free? Yes, your Xbox Live Gold membership allows you access to online gaming. And I agree that Microsoft has the right to charge for that. The large servers needed to be able to handle the stress from all of the users using their Xbox consoles are expensive and costly to maintain. But Microsoft is turning their focus away from online gaming (even though gaming is the ultimate selling point for the Xbox consoles) and focusing more on the Xbox being the center of your home theatre. With Microsoft turning more towards content streaming, why are they still charging such a ridiculous amount of money to be able to access something we already pay for? Back when playing Halo online was why most people signed up for Xbox Live, it made sense to charge everyone a fee to get in one some of the online action. But things have changed, it’s gotten to the point where the only reason Microsoft is keeping the Xbox Live membership around is for the revenue it produces. It’s time for Microsoft to disband the Xbox Live membership and either provides free online gaming or start charging a monthly fee for online gaming. But charging your users to access something they already pay for is a bit ridiculous. Unfortunately, I highly doubt that Microsoft will change anything regarding their Xbox Live membership. It’s a huge source of income for the company and face it, if we were them, would we get rid of it? I didn’t think so. No matter how much bad publicity Microsoft gets for how they have their membership setup, they will not give up such a lucrative income stream. 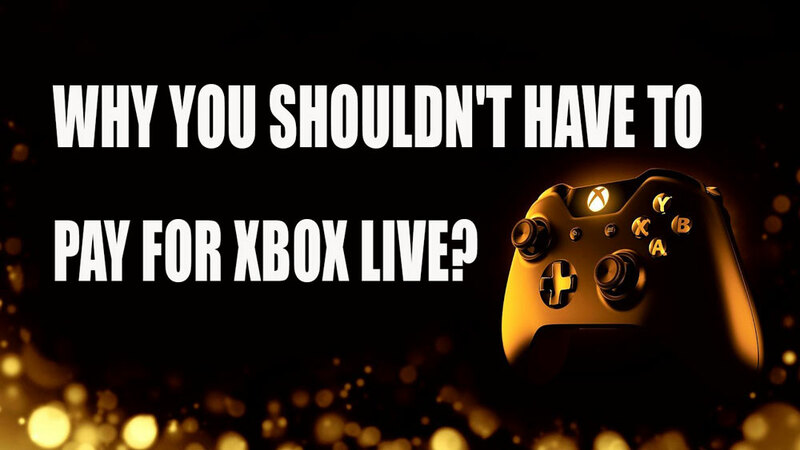 But you’re in luck; there are many ways that you can get Xbox Live codes without having to pay for them. Make sure you check out our guide on how to get free Xbox live in 2018!